Kanye West and Kim Kardashian West apparently are creating a kids' clothing line, and their baby girl North has showed off some pieces! Kim revealed a few of the pieces on Snapchat, as she filmed North strutting her stuff in a yellow sequin dress and matching yellow shearling coat.“Wait, let me see this outfit that you’ve got on. Do you see this Yeezy jacket? Is that a Yeezy yellow shearling?” Kim asked Nori. I don't care what nobody says. The Kardashian family is filled with HUSTLERS. Kim and Kanye aren't rookies in the fashion world, obviously, so it makes sense for them to do this together. I probably won't be buying since I don't have kids myself. If I did though, I might choose different colors for both the jacket and dress, but it's an all right look overall. 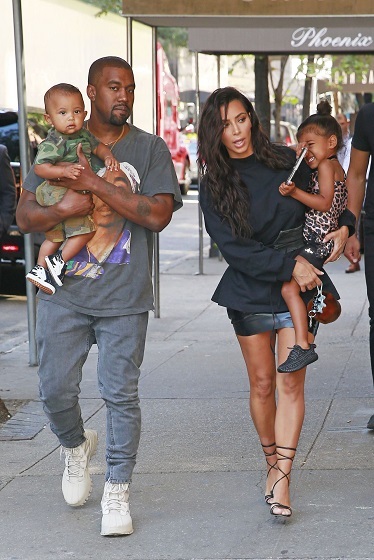 Would you buy kids' clothes from Kim and Yeezy?